First there was the Summer of Arcade. Then came Game Feast. Now XBLA is offering yet another promotion. 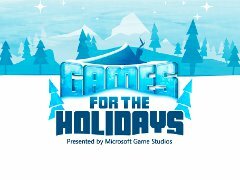 This time around they are calling it Games For The Holidays, and from the looks of it, they put a lot of work into this one. It follows the standard “One Game Per Week” format, but rather than having “being part of a promotion” as their only common ground, Microsoft has selected three games with similar themes and tones, and has helped them to work together to form a three headed hydra of game marketing. The first game is the sequel to A Kingdom for Kelflings. Following the well established Mario Naming Convention ™, Ninja Bee has named the sequel after the next largest environment, dubbing it A World of Kelflings. Just as you did in the original game, in World of Kelflings you’ll be playing as your avatar, helping a community of lilliputian laborers build a series of kingdoms, or just kicking them around if you are into that sort of thing. As avatars have advanced, so too has the game, allowing your props to show up in-game. Local and LIVE multiplayer are available, and there are all sorts of unlockable things like musical cannons and avatar emotes. A World of Kelflings will release on December 22nd, just in time for Christmas. The next game is Raskulls. (I see what they did there.) This game comes from Half Brick, creators of Fruit Ninja. Judging from the videos, this doesn’t just bring new meaning to the term “Puzzle Platformer”, it brings the meaning that should have been there from the start. You take a variety of creative characters with unique abilities sprinting through a level, encountering tetris-like color blocks that you can destroy to clear your way. The pace, art style, and tone have already got me sold on this one, which will be out December 29th. The final entry is ilomilo. This game, which flagrantly disregards standard capitalization, is from Southend Interactive, and once again has a style that grabs my interest. Everything looks to be sewn together out of scraps of cloth. A puzzle game in the more traditional sense, ilomilo puts you in control of ilo and/or milo in their quest to reunite. Each of the characters begins each level in a different position. The playfield is a network of cubes, and shifts and rotations allow your characters to walk along each of the sides of the cubes, providing different orientations. The level ends when you are able to meet face to face. You can give it a try on January 5th. Aside from choosing top notch games for their lineup as always, Microsoft has upped the ante with this promotion by tying them together. All three games are family friendly offerings that emphasize teamwork and creativity, so the chances are if you like one you’ll like them all. Purchasing any one of the games earns you a demo of the other two, too, even if they haven’t been released yet. Not only that, but owning all three games unlocks items from each that you can use in the others. Play as a Kelfling or ilo and milo in Raskulls, have characters from the other games visit your Kelfling Kingdom, or score Raskull and Kelfling Costumes for ilo and milo. In addition, each game costs just 800 MS points, and each can unlock two avatar items. Seriously, the Xbox LIVE marketing team has really outdone themselves this time. With any luck we’ll be able to snag review codes for each, so we can keep our XBLA promo record alive.